This is so hard....the tears still flow, and it's been over a week since we let Kiggan go to the Bridge. He was the 2nd champion for his mom, Spice, and he finished the same day she did only several years later. He came back to live with us when his family, Tom, Sharon, Owen and Chelsea Boomsma, were killed on September 23, 1996 in a car-semi-school bus accident in Wisconsin. Every year on the anniversary of their death, Kiggan, Greg and I would visit the cemetery and he'd place 4 milk bones on the head stone monument for the family. We were blessed to have this wonderful dog live with us since 1996. He was never ever sick a day in his long and happy life. 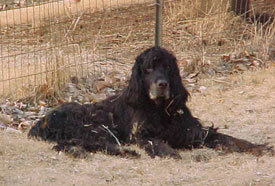 We share with you a few photos of Kiggan as we fondly remember him. For those of you that remember our Trouble, I remembered him with the song by Diamond Rio, entitled, "One More Day." Recently, country-singer, Jeff Bates has a song out entitled, The Love Song. Where's she from, who's her dad? Finished same day as his mom - only slightly later.. Thank the Lord, "let him go." "No I can't." "But you must, send him home..."
Kiggan was Greg's buddy, too, and in his honor, Greg composed the song that you are listening to in the background. Greg entitled it, "The Last Days of Winter." Good-bye gentle friend. Kiggan's first major under Dr. Harry Smith in June 1992. 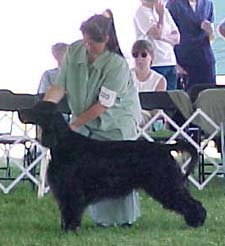 Kiggan at the 2000 GSCA National with Peggy DaValt. Veterans' Sweepstakes class 11+ years. This is one of the last shots we took of Kiggan. It was the 2-year anniversary of when Trouble went to the bridge - March 17, 2003. I remember telling him that it was okay to go visit Trouble. Little did I know that it would soon be time. Good night, sweet and gentle dog. We will always love and remember you!! 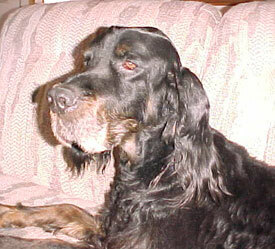 © 1997- 2003 Amethyst Gordon Setters. All Rights Reserved.